Paris, 1960. Jean-Louis Joubert (Fabrice Luchini) lives a peaceful yet boring bourgeois existence with his wife (Sandrine Kiberlain), a perfect socialite, his children in a boarding school and his finance office. 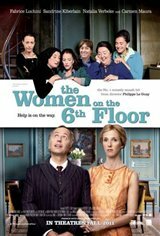 The family has their world turned upside down when exuberant Spanish maids move into their building's sixth floor, the servants' quarters. Teresa, Carmen, Dolorès, Concepciòn (Carmen Maura) and her niece Maria (Natalia Verbeke) who just arrived from Burgos. Jean-Louis will unexpectedly bond with them, especially with Maria. She is young, pretty and full of joy. In a word, Jean-Louis' life is about to change... a lot.